Home » Cartography » There is Only 1 Shenzhen River, So Why Does Google Maps Show 2? A few weeks ago, I wrote about some of the world’s most peculiar territorial disputes. And among them I listed Arunachal Pradesh, a territory claimed by both China and India. What makes this dispute “peculiar” is not the dispute itself, but rather how the borders shown in Google Maps change depending on who’s looking at them. The images below show Arunachal Pradesh (or South Tibet, as it’s known in China) as it appears in Google Maps China, Google Maps India, and Google Maps USA. 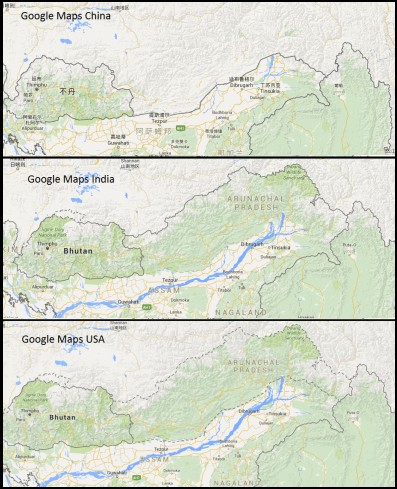 The borders of Arunachal Pradesh look different in Google Maps China, Google Maps India, and Google Maps USA. Far from being an isolated curiosity, the changing borders of Arunachal Pradesh are just one of many odd features present in Google’s mapping of China. For example, In the map above, you might also notice that the river shown in the India and USA images is strangely absent from the Chinese map. Below are the Chinese and U.S. versions zoomed in closer on the river. 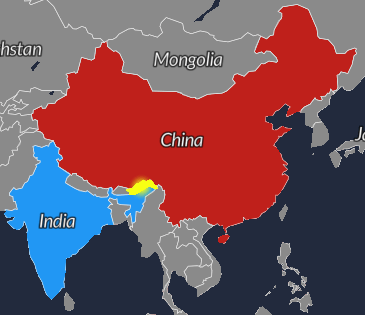 The dotted line is the border between China (above the line) and India (below the line). Indeed, the river is completely omitted from the Chinese map at any zoom level. And for that matter, so is the road in the upper left corner of the image. It is visible below the border, but after the road crosses into China, it disappears. In a sparsely populated region like Arunachal Pradesh, it may not be too surprising to find a few idiosyncrasies in Google Maps. But this next example makes it clear Google Maps is doing something strange when it comes to China. In no place is China’s peculiarity in Google Maps more apparent than at its border with Hong Kong. China and Hong Kong are separated only by the narrow Shenzhen river. And with plenty of infrastructure and geographical features on both sides, the mapping differences are extremely apparent. The images below are from the U.S. version of Google Maps, zoomed in on the Hong Kong – China border. Both images are the same, except that on the right, I have overlaid the road network from OpenStreetMap. The Hong Kong – China border via Google Maps USA (left). The same area with the OSM road network overlaid (right). In Hong Kong (below the river), OpenStreetMap and Google Maps match exactly. In China (above the river), the road networks do not line up. Another strange effect appears if you zoom in closer on the river. As shown in this next image, Google Maps shows several buildings in the middle of the water. The strangest effect of all comes when you view this area in the Chinese version of Google Maps. Not only do the roads not line up, but here Google has the Shenzhen river splitting apart into two separate rivers, flowing side-by-side. Impressively, it actually looks pretty natural. Below is an interactive version of Google Maps, zoomed in on the Hong Kong – China border. Tap the button to toggle the OSM road network on and off. See what it looks like when you switch to terrain mode. Earlier this year, a spokesperson for the Chinese Foreign Ministry made this statement, giving some historical perspective. Chinese law prohibits the publication of geographic information about China. It considers such information to be State secrets, which could be used by its enemies to pinpoint military targets. Reportedly, the sentiment is a holdover from the Cold War. Since this law was introduced in 2002, China has pursued numerous cases of illegal mapping, with the accused parties ranging from foreign geology students to Coca Cola, who China investigated for illegal espionage in 2013 in relation to the GPS systems in its trucks. Google Maps, Bing, and other online mapping services are able to publish maps in compliance with Chinese law because they conform to China’s so called GCJ-02 coordinate system, also referred to as Mars Coordinates. GCJ-02 is based on the familiar WGS84 coordinate system, except that it is said to use an encryption algorithm to shift the coordinates by a few hundred meters from their true locations. As a result, GCJ-02 maps appear entirely self-consistent, but the actual coordinates of any given location are slightly offset from reality. The GCJ-02 system (which Google Maps uses for China, but not for Hong Kong) explains the strangeness at the China – Hong Kong border. The two sides are mapped using entirely different coordinate systems. However, Chinese laws have not stopped OpenStreetMap, MapQuest, and other websites from publishing precise maps of China online. The information provided by these and other readily available sources include coordinates that are accurate to within a few meters. That being the case, it would seem China’s mapping laws are just a case of senseless paranoia. However, China’s fears are not without historical precedent. In 1999, the U.S. bombed the Chinese embassy in Belgrade, later explaining it as an accident caused by an out of date map. And in 2010, Nicaragua and Costa Rica nearly went to war due to an inaccuracy in Google Maps. As shown in the map of disputed territories I posted a few weeks ago, China is involved in disputes over 14 separate territories with 8 other countries, more than any other nation. And that doesn’t count Taiwan, Hong Kong, and Macau, all of which China considers under its sovereign control, despite each of them operating under separate political leadership and separate economic systems, including entirely different currencies. Under Chinese law it is illegal to publish maps that deviate from China’s official territorial assertions. 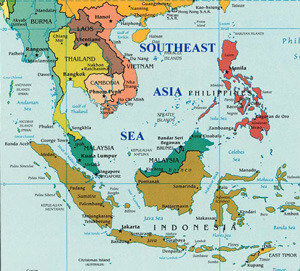 Particularly sensitive at the moment is the territory claimed by China in the South China Sea. 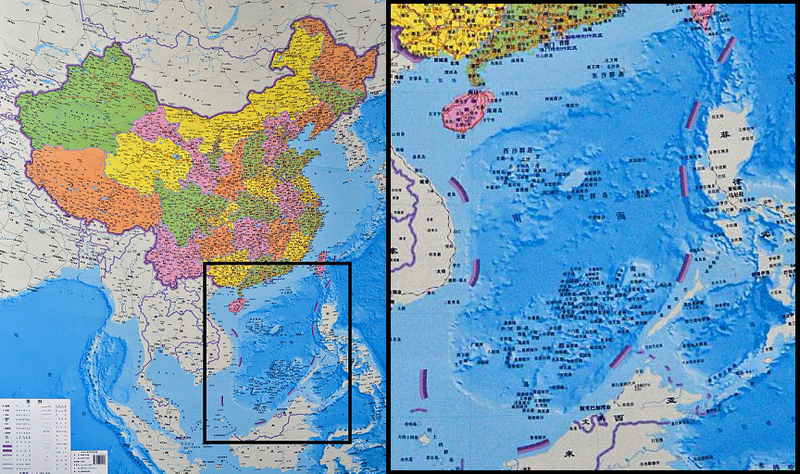 As shown in the map below, China’s self-declared maritime boundary (the dotted line) encircles nearly the entire sea, running right up against the coasts of Vietnam, Malaysia, and the Philippines, leaving each of them with only a thin buffer of sea territory. These three countries have pushed back, accusing Google of favoring China by labeling disputed islands under their Chinese names and/or explicitly identifying the islands as Chinese territory. It’s no secret that Google has had a contentious history with China, and now wants to get back in China’s good graces in order to expand into the Chinese market. And according to Vietnam, Malaysia, and the Philippines, Google Maps has been violating its own policy on disputed territory in order to curry Chinese favor. Earlier this year, Google Maps removed the Chinese name from one such island, Huangyan Island, and replaced it with its international name, Scarborough Shoal. Google made the change following an online petition that said its maps were unfairly strengthening China’s claims. Currently, Google is named on an open petition to change the name “South China Sea” to “Southeast Asia Sea.” So far, 77,312 supporters have signed. Don’t know where the data is coming from, but the Hong Kong border looks misaligned in that one too. Viewed in satellite mode, it’s on the Hong Kong side where there roads don’t match up. I lived in Shenzhen for two years. I had to learn quick that using Google Maps was ineffective, particularly when it told me the location of my school was in the Shenzhen river. Was just wondering if the coordinates issue was common knowledge to people who live there. Guess the answer is yes. Good posts. Would have expected the vector field to look a lot more complex. Seems pointless to make an “encrypted” coordinate system when the pattern is so clearly visible. Looking at the google maps screenshots I think some of these problems, like roads drawn over rivers, may not have anything to do with border disputes. It’s just a good old-fashion geo-data screw up. If you take data from a variety of sources, often river data often comes form a different organisation, and it’s easy enough to end up with a situation where the sources disagree dramatically. In OpenStreetMap we see similar problems when people have done “imports” of data from a variety of sources. Often these are “official” and “authoritative” sources, and there’s an assumption that their accuracy will therefore be perfect. No such thing. With OpenStreetMap we have the advantage that people can spot the problems and edit the map to iron them out over time. That process sort of automatically happens, starting with the more noticeable problems affecting city maps. Depending on the quantity of badly misaligned imported datasets, it can take a while though. This held back OpenStreetMap progress in the U.S. for quite a while actually (too many poor quality free government geo datasets imported), but these days there’s a fantastic U.S. map editing community getting on top of that problem. You can have fun with tools like http://maproulette.org finding and fixing data problems. Would not surprise me to see such inaccuracies but for the fact that they are different in the U.S. version. Can’t imagine why Google would use different sources for physical features in Google Maps China vs Google Maps USA. My guess is that Google removes / adds features from near the Chinese border to avoid glaring discontinuities. Though that is only a guess.